Posted April 21st, 2011 by Karl & filed under Service Status. EC2 (Elastic Compute Cloud), which handles Amazon Web Services across the globe went slightly AWOL this morning, causing havoc for sites in various locations. This unfortunately included our services here at MailBigFile. Fortunately, it seemed only the Pro side of our servers were affected, meaning that users could still use our Business or Free services without interruption. This is quite fortunate when you consider other websites such as Reddit, Foursquare and Quora weren’t so lucky, with Quora and Reddit search at the time of this post still down. Posted April 20th, 2011 by Karl & filed under Case Studies. Bord Bia, the Irish Food Board, have used our Business Account for a few months now and have sent over nearly 2000 files. They aim to be a link between Irish Food, Drink & Horticulture suppliers and existing and potential customers. 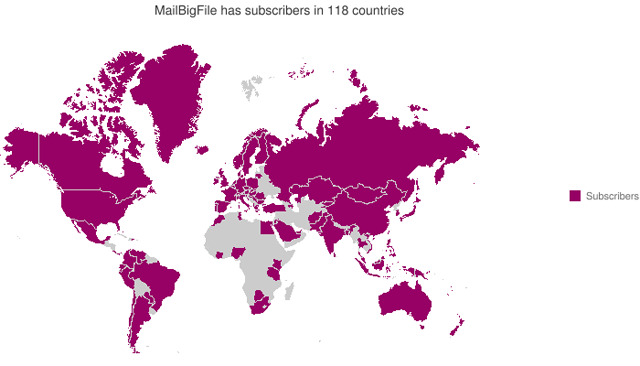 MailBigFile allows them to both send massive files as well as receive them from clients. With offices all over the world our service makes file transfers easy and quick. Posted April 13th, 2011 by Karl & filed under Case Studies. After last weeks French case studies, we now have a selection of Europe based companies who use MailBigFile’s Business Account. Located in Barcelona, Smile are a TV and film production company. Being a multimedia company means large files need to be sent swiftly and securely, especially when dealing with clients such as Coca-Cola, Sony and BMW.